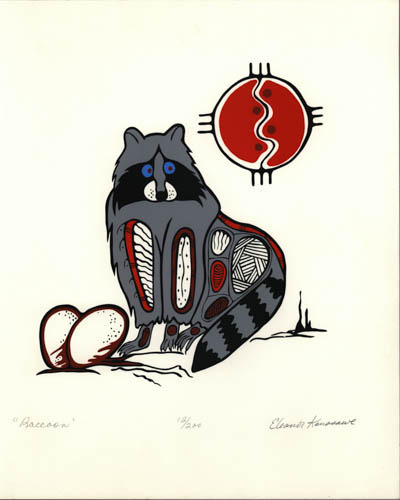 The Ojibwe story of the raccoon and the old warriors reflects a strong connection between man and nature. A unique personality present in many Ojibwe stories as both a trickster and a hero, Nanabush also makes an appearance in this and another story featured in this exhibition. One day Nanabush built two houses—one for himself and one for two elderly warriors who had long since gone blind. The two warriors had supported their village in their youth, so Nanabush took care of them in their old age. He tied a rope from their house to the lake so that they could follow it and get water to drink and to wash.
Raccoon walked by their house one day and decided to play a trick on the old men. He went to the lake and moved their rope away from the water and into the woods. Later that day, the first elder warrior went to get water for the house, but at the end of the rope, he was shocked to find dry ground! “The lake has dried up,” he told the second warrior when he arrived home with no water. The second elder warrior did not believe the story, and followed the rope for himself. Raccoon had already moved it back to its original place, however, so the second elder warrior ended up at the lake. The second elder warrior returned home with water, in a bad mood. The first elder warrior had already made dinner, a stew with rice and two pieces of deer meat. When the old warriors sat down, Raccoon sneaked in to play another trick. He quickly jumped up and took both pieces of deer meat, before the first elder had sat down. The elder warriors began to wrestle over the missing lake and the stolen meat. Raccoon laughed at the two blind men and snuck out the door. On his way home, however, he ran into Nanabush.